Our organisation’s name, The BeingWell, has a double meaning of a) wellbeing (or feeling good) and also; b) a wellspring of being (or human potential). The BeingWell enhances your wellbeing and also shows you how to draw on your own inner wellspring of being to be more fully yourself. BeingWell (ˈbiːɪŋ-wɛl) n. a natural pool where essential resources come to the surface. A means to tap into vital reserves of being fully human. Personal potential rises from the depths to the fore. Being Well (ˈbiːɪŋ-wɛl) v. and adv. the state of being in good physical and mental health. In the short video animation below, we highlight what The BeingWell’s values and mission are and how we go about achieving this. At our heart is our community especially in East London, where we are located. Our vision is to strengthen the wellbeing of all – those working long hours in skyscrapers and those living in relative poverty. We run workplace mindfulness training. This can enhance occupational health as well as learning & development programmes. We care. We use profits to to help run mindfulness programmes in the community. We run mindfulness courses for everyone. Drop-in to a Friday group. Or join us for an 8-week course. Our mindfulness teachers meet the criteria set by the UK Network for Mindfulness-Based Teachers. In addition, we have professional qualifications in working with the human mind. We are a member of Social Enterprise UK, which is the national trade body for social enterprises – business with a social or environmental mission. 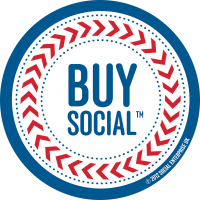 We support their ‘Buy Social’ Campaign, which challenges all of us to think about where we buy our goods and services from, and the social impact of our purchasing decisions. As a social enterprise, we prioritise our vision, mission and values over making a profit. Surplus funds are either reinvested in the business to improve our services or put towards delivering low-cost mindfulness offerings to marginalized groups. Our vision, mission and values are at the heart of everything we do. We believe that the more people know about mindfulness, more people would know how to achieve their fuller potential and thrive through life’s hardships. A society where enhancing mental health is just as important as building physical fitness. To widen access and availability of mindfulness taught by well qualified mindfulness teachers. We deliver high-quality mindfulness training to businesses and use profits to bring low-cost mindfulness to economically disadvantaged groups and not-for-profit organisations. Openness: We are open-minded, inclusive and approachable while also respecting confidentiality. Collaborative: We make a bigger difference by working in partnership. We respect the expertise of others and value diversity to respond to the needs of our clients. We are open to new ideas and work to deliver trainings, which are much more than ‘off the shelf solutions’. Integrity: We aspire to embody the principles of mindfulness in everything we do as an organisation to lead by example. Passionate: We are passionate about our vision and mission and are committed to consistently doing our best in working towards them. Being and staying well: Teaching mindfulness as a healthy mind habit to support people’s overall wellbeing and to help them stay well even through adversity. Enlarging wellbeing services: Raising awareness of mindfulness and encouraging organisations to evaluate the effectiveness of mindfulness as another resource for their employees and / or service users. Enabling social participation: Bringing mindfulness to marginalised groups. This could help prevent common mental health difficulties, which can limit people’s ability to work and participate fully economically and socially. Removing inequality of opportunity: Supporting communities so that economic disadvantage is not a barrier to people accessing mindfulness classes. Organisational excellence: To be the best that we can be in service of our clients and community. We do this by working in partnership with other organisations and experts, continuously updating our knowledge, and reaching out to groups we believe we can make a difference to. We work with employers to integrate mindfulness into staff programmes. This includes staff wellness, learning and development and employee relationships. We have delivered staff training to a range of organisations including Urban Outfitters, Liberty Insurance, Lloyds Bank, the property and construction company – the Canary Wharf Group; the audio-visual business – Electrosonic; and a local housing association – Tower Hamlets Homes. We run popular, well-respected and researched mindfulness programmes such as mindfulness-based stress reduction (MBSR) and mindfulness-based cognitive therapy (MBCT) for the general public. We offer concessions to those who otherwise would not be able to do the training. And we regularly hold low-cost and free drop-in classes for the general public to learn more about mindfulness and keep up the practice if they have already done a course. We use profits from mindfulness at work trainings to deliver high-quality trainings to not-for-profit organisations and community groups. For example, we have worked with a local survivors of abuse group – survivors together; a local mental health charity – Mind; a local university to help students through exam stress; and we are currently partnering with a local NHS trust to bring mindfulness to vulnerable people in our society.